The University of Texas/Texas Tribune survey of 1,200 registered voters was conducted from February 15 to 22 and has an overall margin of error of +/- 2.83 percentage points. For more information, please reference the methodological appendix in the data archive. At this still early stage, more Texans say that they would definitely vote against the president's reelection than say they would definitely vote for the president. Majorities of voters of all stripes support requiring voter approval before property tax revenue increases too quickly. 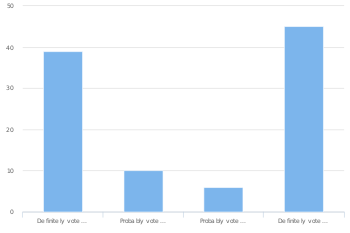 Respondents were asked, "How often do you think that people who are not U.S. citizens vote in Texas Elections?" Party identification is calculated according to the PID7 variable, a seven point scale of party identification. Respondents were asked, "What would you say is the most important problem facing this country today?" Respondents were asked, "You said you oppose building a wall along the border between the U.S. and Mexico. Which of the following is closer to your opinion?" Race is calculated according to the race variable. Respondents were asked, "What is your opinion on the legalization of marijuana possession?" Religiosity is calculated according to the IMPORT variable. Respondents were asked, "In your opinion, do Texans pay too much, too little, or about the right amount in property taxes?" Education is calculated according to the EDUC variable. 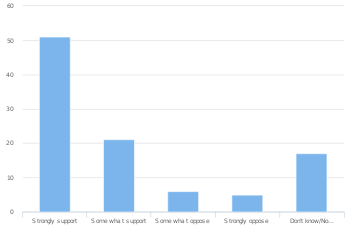 Respondents were asked, "Do you favor or oppose each of the following: Increasing the federal income tax for all U.S. taxpayers." Race is calculated according to the race variable. Respondents were asked, "How would you rate the job Dan Patrick is doing as Lieutenant Governor? Would you say that you…" Fundamentalism is calculated according to the LITERAL variable. Respondents were asked, "In general, do you think gun control laws should be made more strict, less strict, or left as they are now?" Gender is calculated according to the GENDER variable. 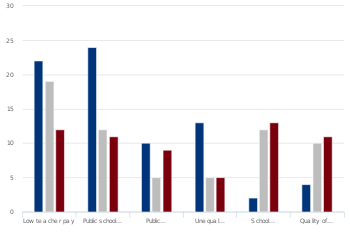 Respondents were asked, "Which of the following do you think is the third biggest problem facing the K-12 public education system in Texas?" Education is calculated according to the EDUC variable. Respondents were asked, "Is Texas’s increasing racial and ethnic diversity a cause for optimism, or a cause for concern?" Race is calculated according to the race variable. Respondents were asked, "How would you rate the job Donald Trump is doing as president? Would you say that you…" Community is based on the following question, " Would you say that you live in an urban, suburban, or rural community?" Respondents were asked, "Do you think the government should or should not require parents to have their children vaccinated against infectious diseases (e.g. measles, mumps, whooping cough)?" Age is calculated according to the AGEG variable. Respondents were asked, "Do you favor or oppose each of the following: Increasing the federal income tax on families earning over 250,000 dollars a year" Gender is calculated according to the GENDER variable.